Superheroes and open-world game mash-ups are the specialities of modder JulioNIB. If you could be any superhero you wanted in the world of Grand Theft Auto V, who would it be? Julio Cesar da Cruz Schwab is a 28-year-old programmer and modder who lives in Maringá, Brazil. He goes by JulioNIB on YouTube and runs the GTA X Scripting channel, where he shows off some of the coolest mods available for GTA V on PC. Thanks to Schwab, you can play GTA V as Iron Man and the Hulk, use the grappling hook from the Just Cause series, and hack traffic lights, smartphones, and other technology like in Watch Dogs. Schwab started his modding career with custom server scripts for Counter-Strike 1.6 and then worked on mods for Grand Theft Auto IV. His GTA IV mods included the ability to fly over Liberty City in an AC-130 gunship, using Skyrim’s “Fus Ro Dah” shout on unsuspecting pedestrians, and facing off against the Green Goblin as Spiderman. Superhero mods also largely define his work for GTA V. His Iron Man mods include the Mark III suit, as well as a smaller version of the Hulkbuster suit from Avengers: Age of Ultron. 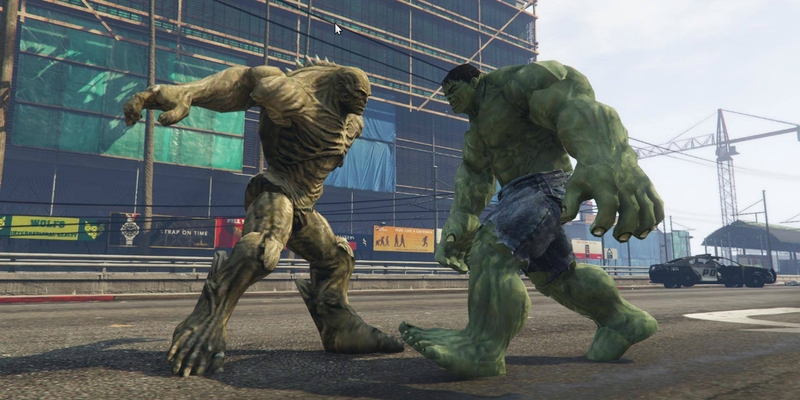 Or you could play as the Hulk and enjoy a good old-fashioned street brawl with one of his arch-enemies, the Abomination. With GTA V, Schwab has also been creating mods that re-create game elements from other open world games. His open-world mash-ups include the grappling hook from Just Cause 2 and Watch Dogs-style hacking. Installation directions and downloads for Schwab’s GTA IV and GTA V mods are available on the GTA X Scripting blog. He also posts news and updates to the GTA X Scripting Facebook page, and runs a Patreon where fans can donate to support his mod development. We spoke with JulioNIB via email about his work and where he hopes to go with it in the future. What guides your selection as to which mods to work on? Basically, I search on Google for tutorials and stuff related to modding. A large portion of my knowledge came from the GTAForums site, but the greater part of the things I do in my mods is a result of trying to game features in a way they’re not meant to be used. Two of your coolest mods are Hulk and Iron Man. You’re currently working on The Flash, Superman, and Spider Man. Are you a comic book fan, or do these mods originate more from fandom of superhero movies and television shows? I usually try to make what my fans ask for more of. I like Spiderman, X-Men, the Hulk, Superman, and other characters [stories], but I’m not a fan of comic books. If time and technical limitations were not an issue, which comic book character not currently on your to-do list would you create for GTA V? Thor is a good choice. Spiderman would be amazing. Any X-Men characters, like Cyclops. Right now the biggest issue is the required animations. We can’t create custom animations. You also like blending other open-world games, like Watch Dogs and Just Cause, into GTA V. What would be your dream mash-up with GTA V, again if time and technical limitations were not an issue? I like to say that GTA is “any game” we want it to be. One thing that would be very cool is a complete superhero/villains mode where the city would suffer attacks from aliens or other-dimensional monsters and we (in multiplayer) need to save the city. But if we are talking about bringing other game features to GTA V I would like to see features from Prototype or Infamous in GTA V. I never played those games but they seem really cool in the videos out there that I’ve seen. Are the superhero mods more difficult to develop than the game mash-up mods? The superhero mods are easier in a certain way. I can choose features to add or ignore because we don’t have a recipe of all the features required. When making something like the Watch Dogs mod I need to see in-game how things behave. There’s a customized HUD or UI and a lot of details, so it’s more difficult. The biggest challenge with the superhero mods is the animation and FX required to simulate the powers. Are there other GTA modders whose work you follow and enjoy, and who you think fans of GTA mods ought to watch? In the past I’ve worked directly or indirectly with other modders like SkylineGTRFreak, Metalwarz, ac.amir, Boblester, and many others. They are cool and made very nice mods. Is all of this purely for fun, or do you hope to get noticed and get a job in video game development? It started for fun and has now become a really enjoyable job! A job developing games would be interesting. This year I want to start researching mobile app development, or to try and make something in Unity or Unreal Engine. Some indie developers have asked me to help them with some projects, but I don’t have the knowledge to help them at the moment.